Woven furniture, or furniture items which include woven elements, have been in use from the earliest civilizations of Egypt and China. The common rush woven seats are so called because of the use of bulrushes for this weave in ancient Egypt. Cattail, the common North American name for this marshland plant, is still the primary material used in genuine rush seats. The characteristic diagonal cross pattern is woven onto an open frame. Several other twisted and corded materials, including seagrass and heavy kraft paper, are also used to weave diagonal cross pattern seats. Other patterns than the traditional diagonal cross have also been developed. Danish Cord is both a material and a pattern innovation for open frame weaving developed in the second half of the twentieth century. Binder cane, a wider cut of the outer skin of rattan, can be used in open frame weaving with herringbone and basket weave patterns. Material innovations resulting from a lack of the standard weaving materials during the American westward migration of the nineteenth century include rawhide as well as ash or oak splint. The hard, glossy, outer skin of the rattan vine has been used since the days of ancient China for weaving seats for chairs. This rattan cane is still the most widely used material for chair seats and is available in pre-woven sheets as well. The most common woven pattern is illustrated in the photo to the right, but other interesting and attractive weaves have been developed for hand woven cane chairs as well. If you have one of those weaves, we can help you. The elaborate designs of victorian era wicker furniture resulted from a discovery of Cyrus Wakefield, a Massachusetts businessman, in the 1850s. He discovered that the core of the rattan plant, previously discarded as waste, could be bent to hold a shape and could be stained or painted. From hoops for the skirts of socialites, to hoops for chair backs, to fanciful curlicues and woven sheets, came the widely distributed wicker furniture of the late nineteenth century and beyond. 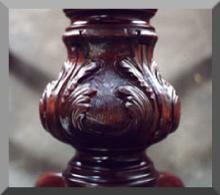 As with all other furniture items, woven items become worn or broken and need rejuvenation. On pages accessed by the links above, we illustrate the services we offer to those with woven furniture.